The medium fits a bit smaller, but that was okay with me since I wanted a large and they were all out of Large. The fabric is very soft and comfortable. Hood fits snug on the head, my fav features are the pockets to my rest my hands in. Thank you for such a great hoodie at an affordable price. 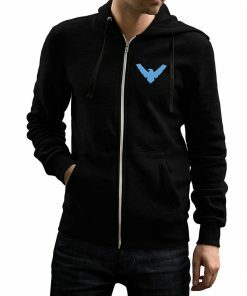 Make a wave of superhero fashion while wearing this Nightwing Zip Up Hoodie to grab the more attraction in your casual gathering produced from cotton and polyester and having tackle features like drawstrings, front zippy style as well as Nightwing Logo On back and chest. Shop your black sweatshirt Now!